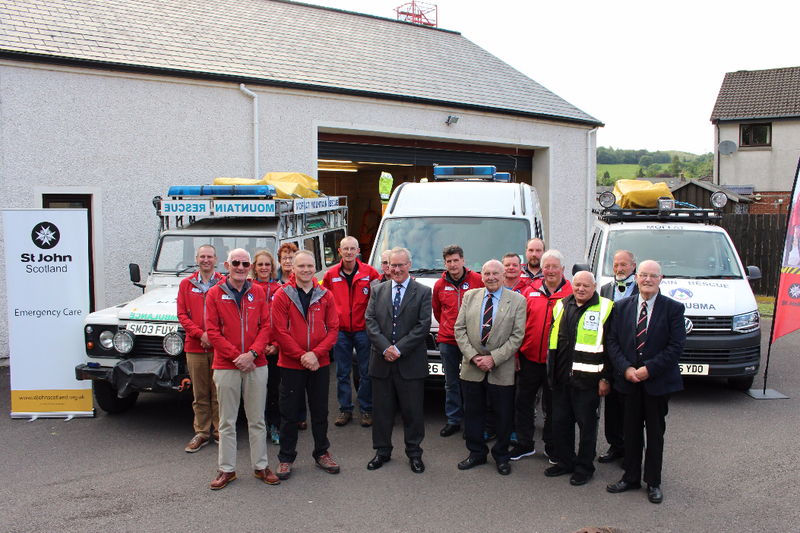 On Wednesday the 7th of June, St John Scotland officially transferred ownership of Moffat’s Mountain Rescue base to the team. St John Scotland’s Dumfries and Galloway chairman, Michael Cook was joined by several members of the committee at the Moffat Mountain Rescue base to mark the handover. The Moffat base, which opened in July of 2007, is the third base of thirteen to be gifted from St John Scotland to the team itself. The cost of these bases has now topped £2 million and until now, were provided to the teams under licence and rent free. Shaun Duignan, Team Leader of Moffat Mountain Rescue said: “The team are extremely grateful for all of the assistance we have received over many years from St John Scotland which includes helping to provide two of our vehicles as well as our base. In this day and age, to be able to provide our region with an effective mountain rescue service requires us to be well equipped, trained and also have a good facility in which to store equipment and train. The assistance from St John Scotland in meeting these requirements has been invaluable to the team. St John Scotland will maintain a close relationship with the Moffat Mountain Rescue team and upon its transfer, the base will be known as ‘Moffat Mountain Rescue Team, St John Base’.